We use all our water! What does this mean? Most car washes filter their water in order to get that Spot Free Rinse. During the filtering process the water that has all the minerals is dumped down the drain and wasted. We don’t throw that so called “hard water” away. 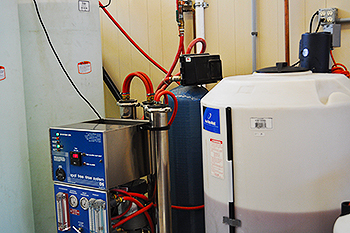 We save it in storage tanks and use it for wash cycles that don’t need that “Spot Free” water. For example, the undercarriage rinse as you drive in to our automatic. This obviously doesn’t need to be spot free water. Additionally, our automatic and self-serve washes are very water efficient. In fact, you’ll likely use less water than if you washed your car at home with a hose. Your car will be clean and the environment will be better off. We also use detergents and additives that are environment friendly! Our non-toxic soap is loved by the environment but hated by dirt. It smells like a little bit of heaven and comes in a rainbow of colors.